In no time, you will become a chopper building guru. There are hundreds of high resolution photos and illustrations on this CD. Descriptions of each project can be found at: www.atomiczombie.com . There's no guesswork, or confusing explanations, and no special tools or skills required. basics to help you get started on your bike building journey. Create your own sick chopper on a budget by learning how to hack and weld old junk bikes, as well as basic welding. There is a radical assortment of bikes on this disc, ranging from kids' chops to full-size street worthy machines. 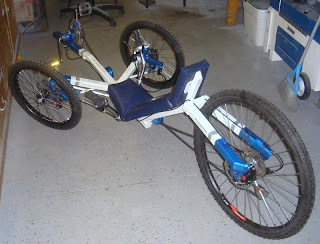 Check out the very first Warrior Trike built just two months after we released the project plan! Coming so on in a few days! Cool 12 do-it-yourself chopper projects - that's one project for every month! Stay tuned for ordering information and get ready to let your imagination loose. What should Brad do about Terminator Chopper? The cold weather is setting in fast, and time is running out on this year's bike building season here. We're leaving it up to you about what to do concerning this last project of the year. Vote on what's next for this project. Each registered member has one vote, so let your voice be heard. Cheat and git 'er done? Want to build your own cool, custom choppers? How about a tall bike? ChopZone.com has 10 free plans online to show you step-by-step how to build your own custom creations. The site also includes Bike Hacking 101 and Welding Basics. All of the projects require only basic tools and skills, so anyone can build their own bikes. No experience is necessary. Well over a year ago, the newspaper published a letter I wrote about the escalating crime in this city, particularly in Westfort. I called upon the chief of police to disclose crime statistics through the media on a regular basis. Years ago, the police released weekly and/or monthly crime stats published in The Chronicle-Journal and The Post (now The Source). No one can explain to me why this suddenly stopped. No one, except for one city councillor who contacted me concerning my letter and suggestions to improve public safety and policing, including the beat style of policing in neighbourhoods and business districts throughout the city. When I think of the chief of police’s name, the one that quickly comes to mind is Chris Adams. I, like many others, really have to think hard to recall the chief’s name. Finally, many in this community have been speaking publicly for weeks and standing up for our police officers who put themselves at risk on the front lines every day. The chief typically gets press coverage when appointed to a board or attending a conference. Yet, Mr. Herman rarely addresses the public directly about our safety concerns and the high incidence of violence and crime. His recent remarks to the media that increasing crime and violence in this city are based on individual perceptions is deplorable. Avoid certain areas, especially at night, he said. Good luck convincing everyone who lives and works in those areas to pack up and move away so the scumbags can completely take over. I’m sure that businesses trying to make an honest living in those areas he tells us to avoid aren’t impressed with such idiotic solutions. A very small percentage of crime and violent incidents are actually reported in the media. Why are you trying to hide the truth, Mr. Herman? We all have the right to know about what’s really going on in our neighbourhoods, yet you and the police services board continue to make excuses for keeping us in the dark. You all must think that the public is collectively stupid and unaware of what’s really going on in our neighbourhoods. We talk to officers off the record. We talk to our neighbours. We talk to business owners. We talk to emergency services staff. We know a lot more than you think we do, so stop treating us like we’re imbeciles. Our elected city councillors and mayor seem to have collective laryngitis. To my knowledge, as of this date none have publicly addressed our concerns and demands for solutions. In my opinion, it’s time for Mr. Herman to resign. We need strong leadership in this community, people who are committed to increasing public safety and allocating police resources when and where they are needed. Leaders with the necessary fortitude and vision to empower this community. I have a solution for Mr. Herman and the police services board – do the honourable thing and resign. You are all a big part of the problems plaguing this community. After a technical issue today (my CD burner decided to take a holiday for some unknown reason), the CDs were burned, packaged and mailed today. Hope they won't take too long to reach you anxious bike hackers. Also, will be updating the Builders Gallery next week and the November newsletter. If you want to contribute something to the newsletter, contact KoolKat in the forum. Multi Plan Custom Made CDs - first ones ship tomorrow! Thanks to all of you who are taking advantage of the multi-plans on CD. Your support is greatly appreciated. Orders from Saturday until today will be mailed late tomorrow afternoon. Tonight, you'll get an email confirming your order and tomorrow your CD will be in the mail. If you're in the US, expect it will take at least a week or two to reach you (Florida and California seem to have the longest delivery ETA). In the UK, 2-3 weeks. Everywhere else, well, the postal gods say anywhere between 3-6 weeks. Next week, we expect to have the Chopper CD ready, including the anticipated Terminator Chopper, which I'm told will be done this upcoming weekend. The garage is getting damp and cold, so that will probably be the last build of this season for us. We have another surprise coming soon, though. Actually, a few surprises, but will keep you in suspense! Thanks again for your continued support. Helps us keep this community going and growing. Atomic Zombie Projects Now on CD! We are now offering custom made CDs. days (Monday to Friday), your CD will be shipped to you. Choose from three, five or 10 projects on a CD. Shipping is available to USA, Canada, and many international countries. 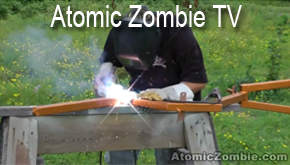 Log on to AtomicZombie.com for more information and to make your selections. A chopper CD will be available in a couple of weeks! Well over a year ago, this newspaper (The Chronicle-Journal) published a letter I wrote about escalating crime, particularly in Westfort. I called upon the Chief of Police to disclose crime statistics through the media on a regular basis. Years ago, police released weekly and/or monthly crime stats published in The Chronicle-Journal and other media. No one can explain to me why this suddenly stopped. No one, except for one city councillor, contacted me concerning my letter and my suggestions to improve public safety and policing, including getting back to the “beat” style of policing in neighbourhoods and business districts throughout the city. When I think of the police the name that quickly comes to mind is spokesman Chris Adams. Chief Herman rarely addresses the public directly about our safety concerns and the high incidence of violence and crime. A very small percentage of the crime and violent incidents are actually reported in the media. We all have the right to know about what‘s really going on in our neighbourhoods, yet the chief and the Police Services Board continue to keep us in the dark. They must think that the public is collectively stupid and unaware of what‘s really going on in our neighbourhoods. We talk to officers. We talk to our neighbours. We talk to business owners. We talk to emergency services staff. We know a lot more than they think we do, so they should stop treating us like we‘re imbeciles. In my opinion, it‘s time for Chief Herman and the Police Services Board to resign. We need strong leadership in this community, people who are committed to increasing public safety and allocating police resources when and where they are needed, leaders with the necessary fortitude and vision to empower this community. Czech inventor unveils cool bike that traverses on land and in water! Dozens of pictures of ridiculous bicycle-related signs, bike lanes that go nowhere, or around in circles. It's real stuff! Just can't figure out what some of those architects and engineers were thinking when designing some of this stuff. Wacky! Someone sent me these pictures lately. I have no idea where they are from. 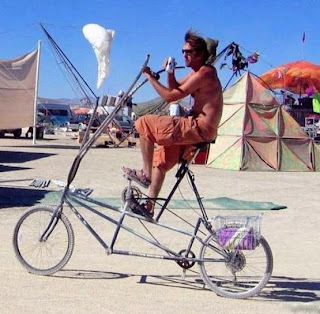 I'm guessing that the bottle bike picture was taken somewhere in Asia, although I haven't been able to find the source yet. 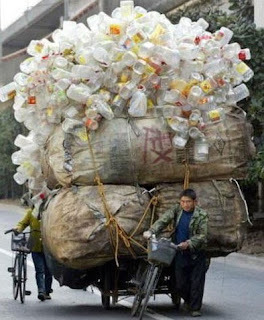 I think it's a very creative use of a bicycle, but I wonder where do all of those bottles end up? A recycling facility? Bottling factory? It would be a strange sight in our city, probably get ticketed by police. Nevertheless, it proves how necessity is truly the mother of invention. This photo looks like something you'd find at Burning Man. A beach-style cruiser that looks homemade. Comfortable enough for the dude to drink a beer while riding. Ah, life on the playa. Geez, I'd like to know where these people live! Looks like a pretty relaxing ride. If only we could by-pass the cold and snow here! OK, it's officially winter here. Got some snow Friday and yesterday. Pretty cold outside. We're taking the weekend off to finally do some much needed relaxing at a cabin, not too far from home. Pretty quiet here. Nice little cabin. Smaller than our livingroom, but heated and very cozy. Not many people here at all. Can't blame them. It's been pretty cold past two days. Not so bad today, though. 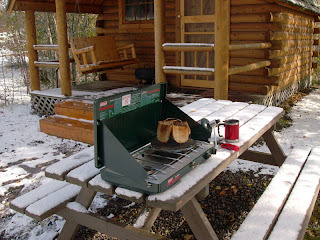 If you've never camped in late fall, you don't know what you're missing. The fall colors are amazing, despite the snow and wind chill. As long as you're prepared for the weather, it's actually very nice and peaceful. Happy Thanksgiving (tomorrow) to all of our Canadian friends and family at home and abroad. Finally! People are demanding answers and standing up for themselves and our community. It's not safe, folks. Don't be fooled by the rhetoric of the so-called leaders of our community. Crime and violence are alive and well here. There are very real, ugly sides to our community that our leaders continue to ignore and sweep under the carpet, all in the name of politics and posturing. We have a lot of problems here and they are only getting worse, thanks to our leaders' sitting on their duffs doing nothing except looking out for their own interests and professional agendas. This is definitely a work of art. So much cutting, welding,and grinding. It's definitely not an easy project, but the end result will be totally cool and unique. Getting colder in the garage, even with the work lamps on, so hope to have it completed next week. Well, as the cold weather settles in fast, it's pressure time to get this over-the-top chopper done. The fall colors will be great for pics of this radical chop. No tubing is used for the frame, only sheet metal. It means alot of cutting, welding and grinding, but the final product will be amazing. Here are some teaser shots of the progress so far. Will be painted and unveiled next week. Stay tuned! Contests included a People's Choice Kustom award which went to Randy French who built and showed off his OverKill-style chopper! 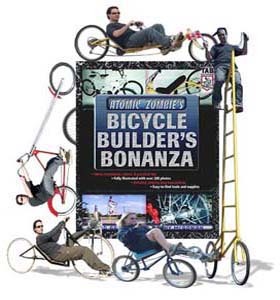 Thanks again Coasters Bicycle Club for inviting Atomic Zombie to participate as a sponsor in this year's fest. Hope we can do it again next year. Well done! 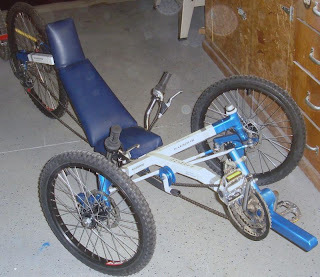 Congratulations to Mike, a new AZ Krew member, who is the first builder to complete the Warrior Tadpole Trike. Very impressed with the quality of his workmanship, and how fast he built it, considering the plan was released August. It really is an honor to see Atomic Zombie projects come to life, and see how others add their own touches. Way to go, Mike! OK, fine. More rules to govern e-bikes. We knew this would happen. Let's also crack down on the annoying, noisy gas powered bikes that are speeding around our streets and sidewalks. Greetings! The latest Atomic Zombie newsletter is now online. - newsletter survey results and contest winners, and more. It's the biggest newsletter we've put out so far - 26 pages!